Villages of Citrus Hills Homes For Sale, Lifestyle Retirement Community Terra Vista Florida. - Waybright Real Estate Inc. Located in Hernando, Florida and deemed one of the best adult communities in the nation, Citrus Hills is the ideal community for active adults seeking the peace of nature and the best amenities offered on Florida’s Nature Coast. From recreational activities, shopping options, and excellent food fare in the area, it is no wonder why so many folks are flocking to Citrus Hills in search of their dream home. The Citrus Hills community is subdivided into a number of smaller "villages," the newest completed of these being Terra Vista. Homes in these villages are clean, spacious, with immaculately kept lawns and landscaping. The "Villages of Citrus Hills" offer single family homes and detached villas with price ranges from $180's to $700's. Terra Vista is listed among the Top 50 Best Master Planned Communities according to Where to Retire magazine. Locally owned Cattle Dog Coffee Roasters is a popular hangout and is "the place where friends come to meet." Within the same shopping complex is a hand dipped ice cream store, Neapolitan; where residents can cool off. The Citrus County Art Center is also located in Citrus Hills and produces about 5 plays and musicals per year with people in the community playing all the roles. They have acting classes, art classes and put on art shows throughout the year. Stop by to see their gallery of artwork, done by local artists. Golf is the most popular activity in this area. 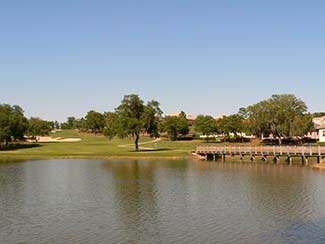 Citrus Hills Golf & Country Club offers two amazing courses: the Oaks course and the Meadows course. The Oaks course is 18-holes of non-stop challenge. From negotiating narrow fairways and twisting oak trees, to putting on slippery rolling greens, it's a golfer's dream. And don't miss the newest addition, Skyview Golf Course in Terra Vista, an unforgettable golfing experience. A newly completed tennis center is located in the Terra Vista village, offering a number of lighted clay courts for those players looking to get in some practice time on one of their 4 oversize lit courts. The nearby downtown districts of both Inverness and Crystal River house quaint antique and novelty stores, cafes, and other excellent restaurants with a variety of ethnic cuisine. Both towns have walkable areas where shoppers and diners can experience the small town, friendly neighborhood community this part of Florida's Nature Coast is known for. Contact Waybright Realty today for more information on Citrus Hills homes for sale.